Libraries are amazing resources – free books, free magazines, free databases, and sometimes, free images. Of course they’re not really free – tax dollars and other monies are used to purchase materials, but the end result is a wonderful world of materials one can access for free. 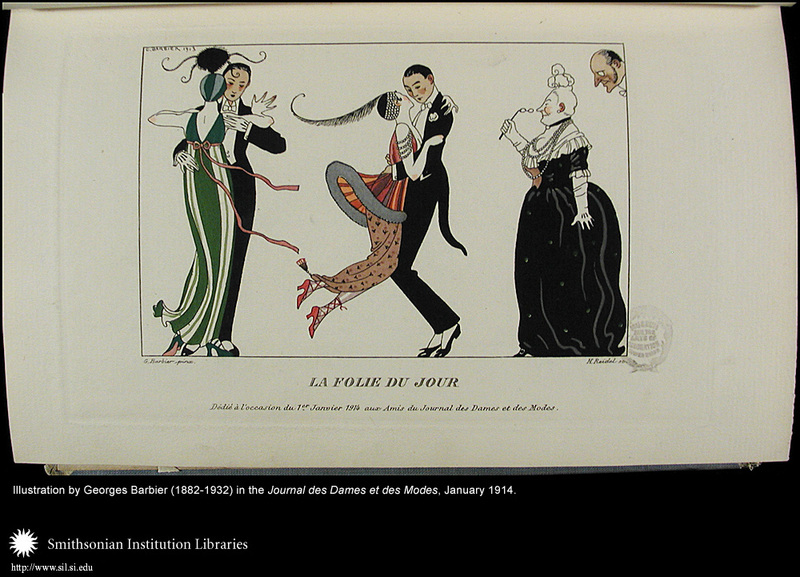 Today’s post highlights the wonderful Digital Collection from the New York Public Library. I choose images from the 1900-1925 time frame, and chose a few that I liked. My favorite is the photograph of Lucille Lortel. What are your favorite image collections? Favorite library? Le messager. [The messenger.] By Édouard Halouze, 1925. Image courtesy NYPL Digital Gallery. Jewelry, Paris, France. René Beauclair. ca. 1901. Image courtesy NYPL Digital Gallery. 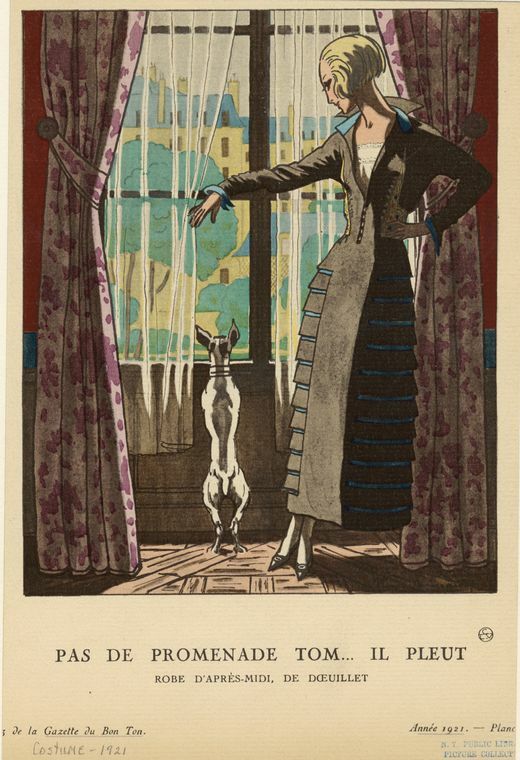 Color study, Georges de Feure, 1901. Image courtesy NYPL Digital Gallery. Robe d’après-midi, de Doeuillet. L.E. (unknown) , 1921. Image courtesy NYPL Digital Gallery. Portrait of Lucille Lortel , ca. 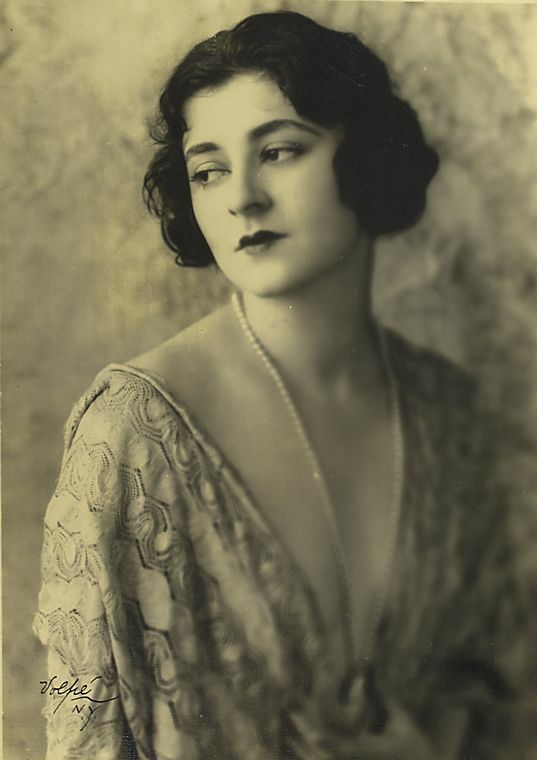 1920’s, by Achille Volpe. Image courtesy NYPL Digital Gallery. My sweetie works at a public library and sometimes checks out new books he thinks I’d like. 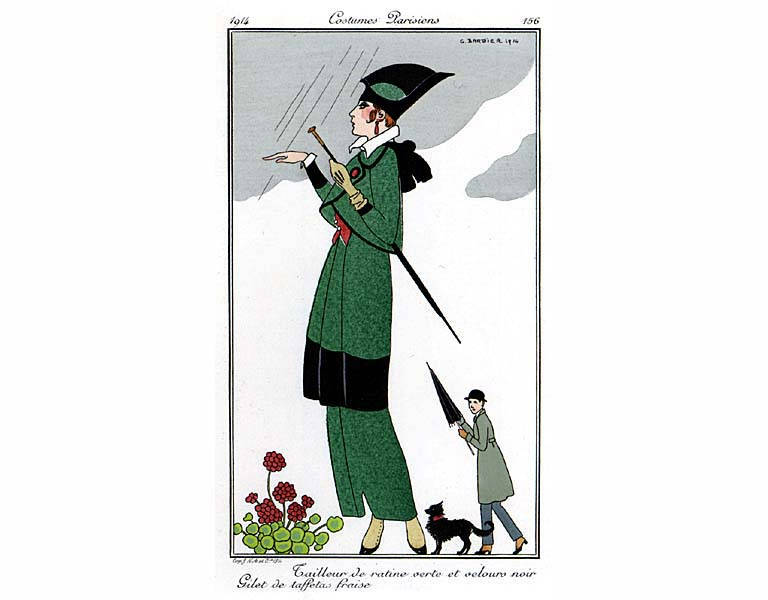 His most recent choice was a wonderful book of illustrations, Fashion, Illustration and Graphic Designs: Georges Barbier, Master of Art Deco. The book was written by Hiroshi Unno, a Japanese author, and is a bilingual English/Japanese edition. 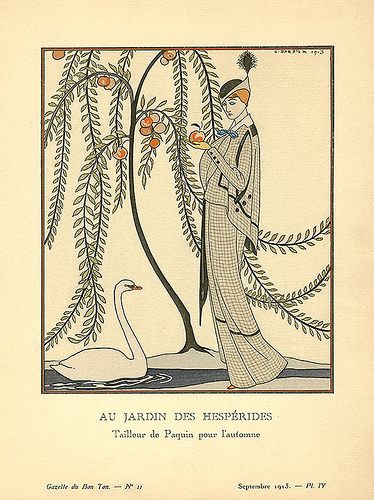 The library’s copy is soft-bound with good quality paper, pretty borders around the pages, and beautiful renditions of Barbier’s illustrations. 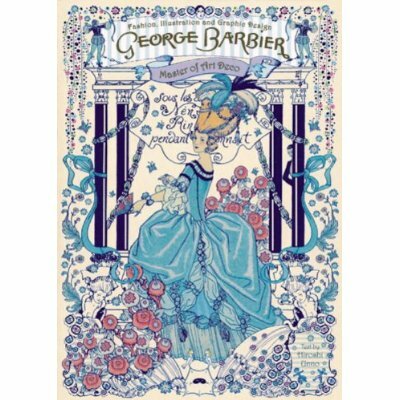 The author provides essays on background information about George Barbier, his coloration process and the pochoir (stencil) process he used to create his illustrations. 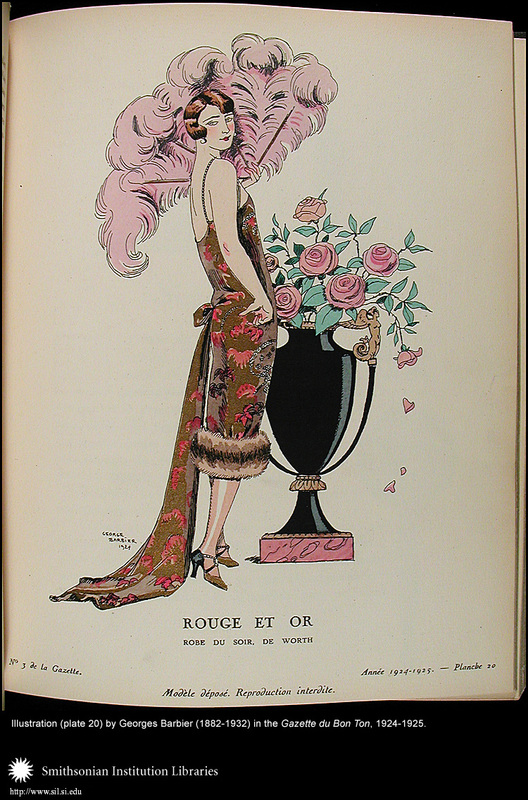 The bulk of the book consists of stunning plates from fashion magazines, theatrical costume sketches, and book illustrations. 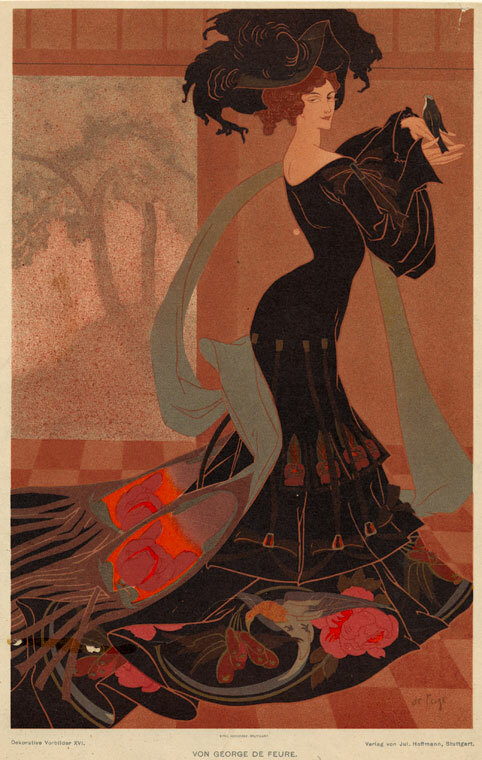 Barbier is well known for his fashion illustrations in high end French magazines such as the Gazette du Bon Ton and Journal des Dames et des Modes, both published in the early 20th century. My knowledge of Barbier was pretty limited but I was immediately drawn to his wonderful fashion illustrations and graphic design works. Below are some images from various collections in museums. Image from Smithsonian Institute Libraries. 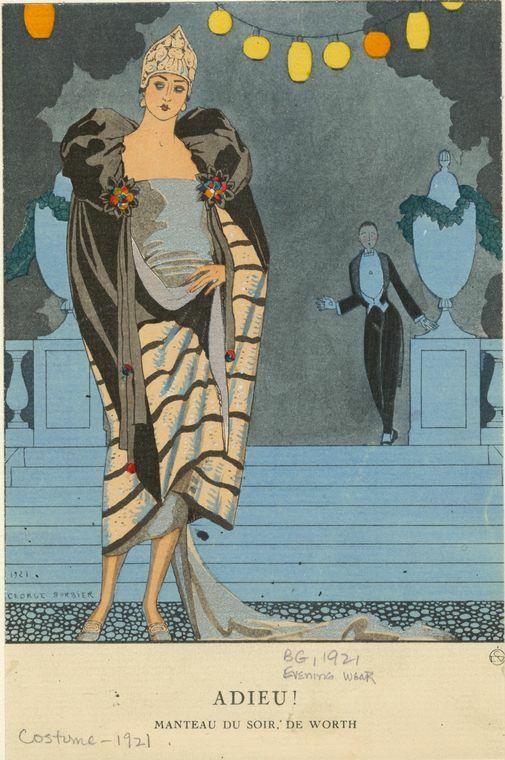 Image from Pratt Libraries Fashion Plate Collection. Unno, Hiroshi. 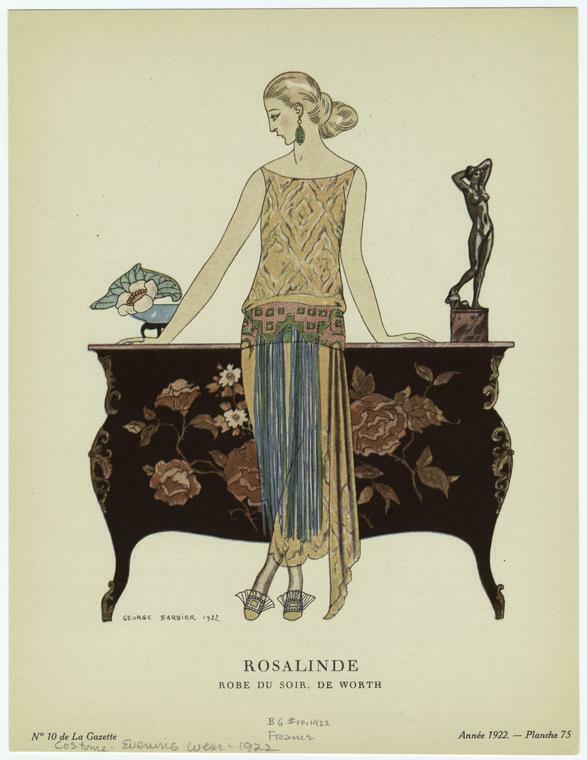 GEORGE BARBIER: Master of Art Deco. Fashion, Illustration, and Graphic Design. 256 pages, including 200 color plates. 4to, wraps. Tokyo, Pie International, 2012. 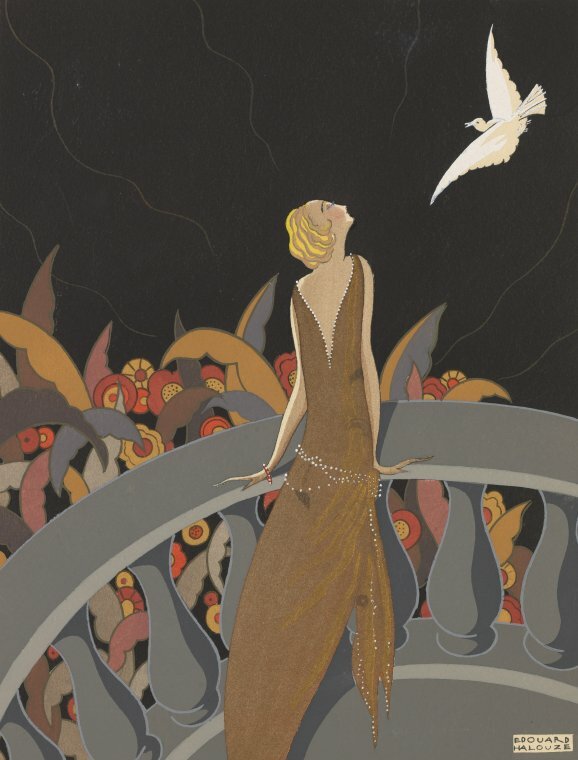 New York Times article by Roderick Conway Morris about George Barbier. Pochoir Prints in the Cooper- Hewitt National Design Library. Peplos gown. Metropolitan Museum of Art. 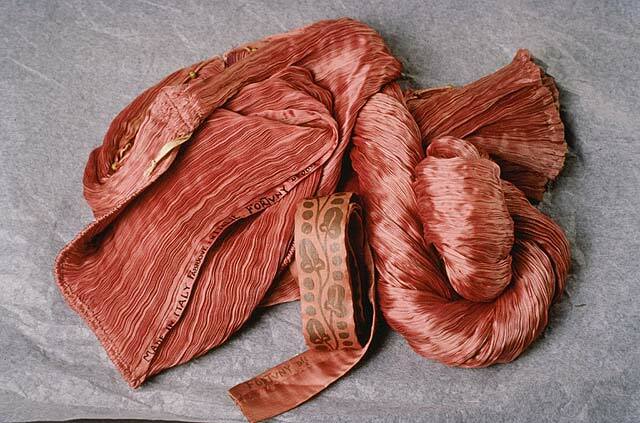 The first time I saw a photograph of a Fortuny dress in a magazine (Smithsonian magazine, I think) was enchanted with the wonderful fabric; it drapes so beautifully, and the tiny pleats are amazing. Mariano Fortuny y Madrazo (1871-1949) was born in Granada, Spain but moved to Paris when he was a young child with his mother. As a young man, he moved to Italy where he lived worked and worked most of his life. Fortuny created these gowns from 1909 until his death in 1949. He based the designs on ancient Greek clothing; the two piece dress is called a Peplos and the one piece is called the Delphos. 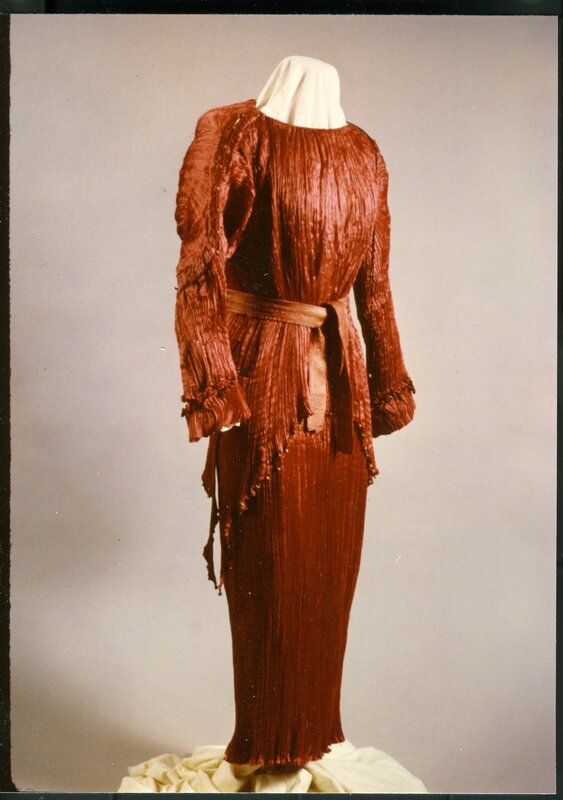 They were originally designed as tea gowns to wear inside the privacy of one’s own home but Isadora Duncan and other daring women wore them out in public. To keep the pleats in the dress, you twisted it and stored it in its own little box. If the dress needed cleaning or needed to be re-pleated, you’d send it back to Fortuny’s atelier in Venice. He took his secret processing of pleating the silk to his grave. What an amazing artist he was. Gown twisted for storage. Smithsonian Institute. If I won the lottery, I’d buy one of these lovely dresses at an auction. Then I’d have to create an event to wear it to…because it doesn’t really fit my current social life here in the Pacific Northwest! Velvet coat and gown. Illinois State University/Lauren Lowell. 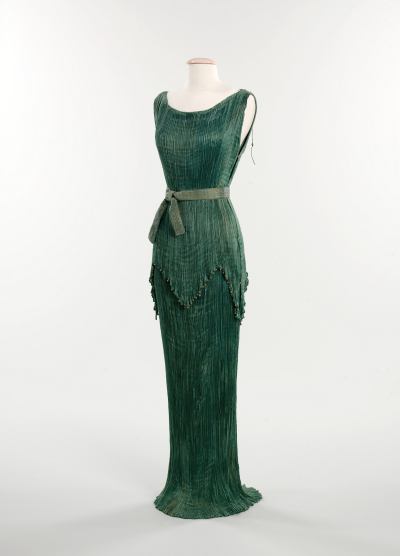 Fortuny gown. Milwaukee Public Museum. 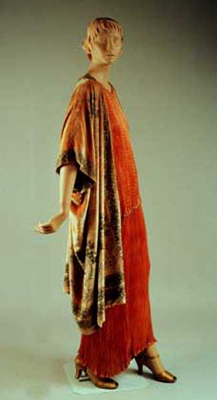 Fortuny gown. Photo Thomas Griesel. Hint: click on this photo, and when the larger image comes up, hover the cursor over it and click. 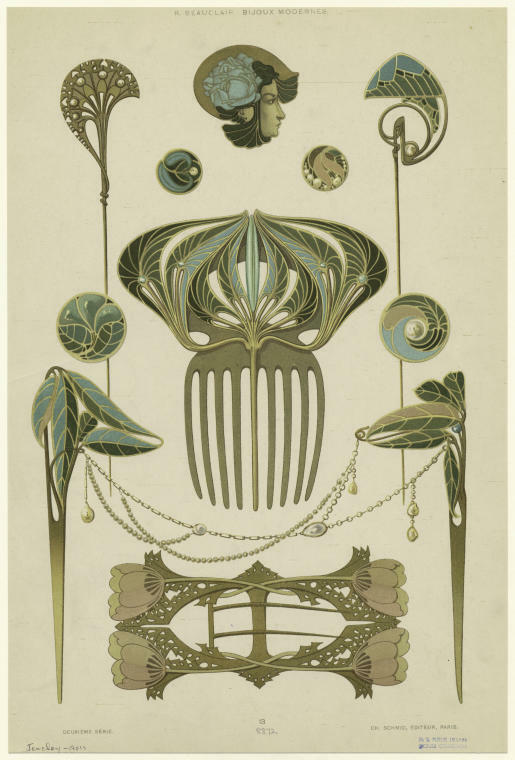 I relied on two sites for most of this information –Senses Art Nouveau and a thesis written by Amy Renee Dykes. It’s been an interesting challenge to figure out when these lovely shoe decorations were made, and what they are made of. They’re heavy for their size, have shiny silver looking backs, and no jeweler’s marks or numbers indicating they’re sterling. I’m not sure they’re steel because they’re pretty scratched on the backs, and soft enough to have bent in some places; to me they look too smooth to be pot metal but that’s just my amateur opinion. 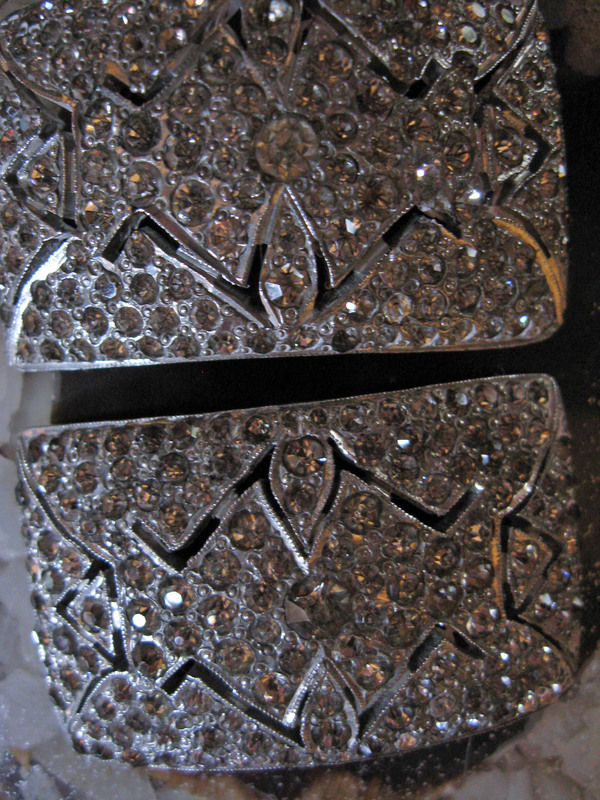 The fronts look like cut steel with lots of little rhinestones or paste. When viewed with a loupe, the handwork and details are just amazing. The metal has been hand carved with tiny round metal spheres alongside the rhinestones. The whole clip is hand-wrought with geometric cut-outs. Each straight edge on the piece, both interior and exterior, are scalloped. Someone put a lot of work into every detail. The stones appear discolored to the naked eye but when I look at them with a loupe, it looks as though the metal underneath the stones is very tarnished, not so much the stones. Maybe they are sterling or silver plated? Maybe they are just really dirty but I’ve learned the hard way never to soak rhinestone jewelry in liquid – I’ve ended up with a sad mess of loose stones with the foil backs permanently destroyed. 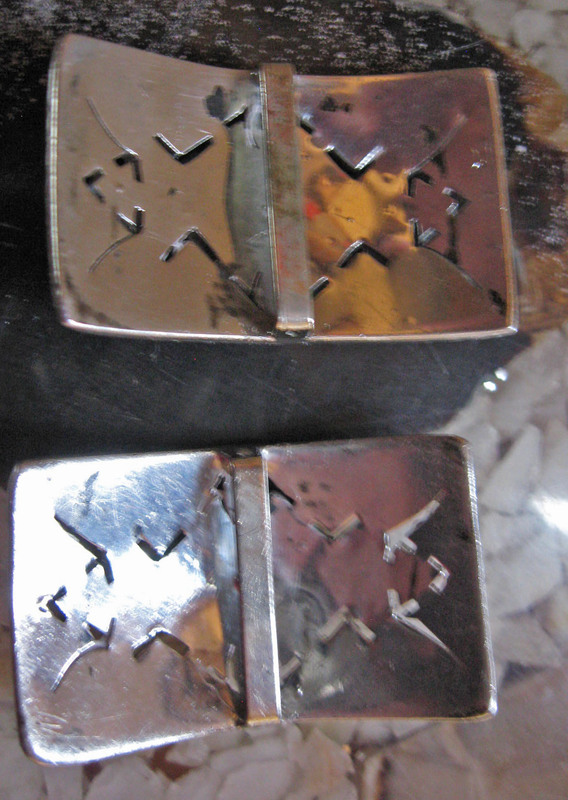 These lovely shoe decorations are often called shoe buckles but they don’t actually function as a buckle. 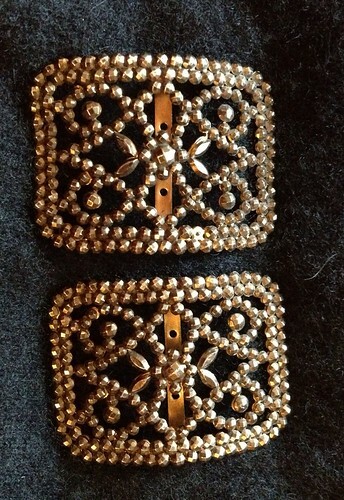 These can be either sewn to the vamps of a pair of shoes, or they can slide over shoe straps that buckle on the side. So, I’m still not sure when these were made. They’re not completely steel cut, which was popular through the late 1890s. The geometric shape reminds me of the Art Deco era, and I did find one similarly constructed pair of shoe decorations on Bustledress.com. So, I’m going with Art Deco but still don’t know what kind of metal. A little mystery in life is good, yes? This pretty ring looks like silver with a spinel but it’s actually some kind of pot metal with a glass stone. It has no markings on the inside, and has that rough pot metal look. 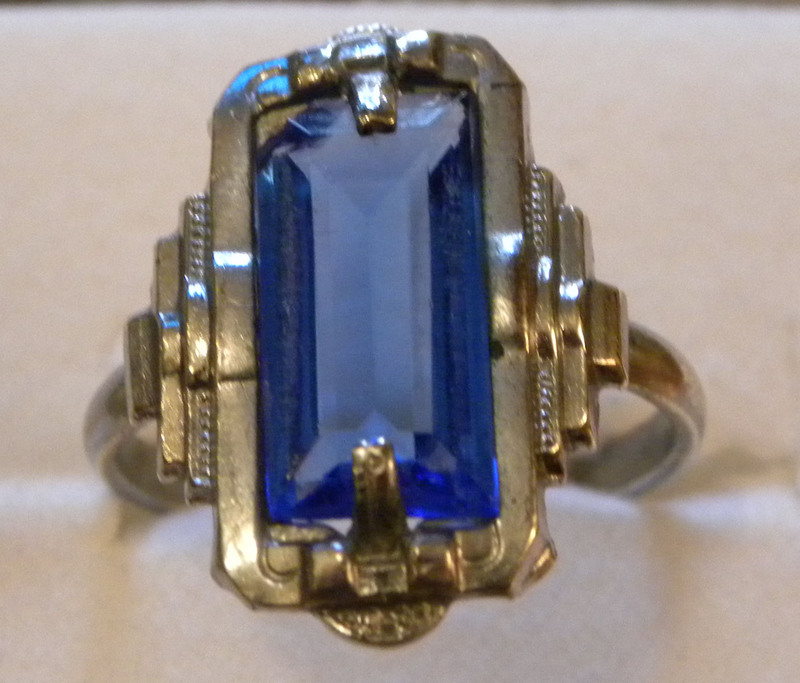 I really like the strong lines of the ring, and the long, rectangular stone. My guess is it’s from the 1920’s or early 1930s. The sides of the ring remind me of the Chrysler building in New York City. I was looking for interesting public domain photographs and came across Europeana, a wonderful website with “paintings, music, films and books from Europe’s galleries, libraries, archives and museums.” Their website says that about 1500 European institutions have contributed to the site. My search for shoes in the 1920s led to this amazing pair of pumps made by Hellstern and Sons, a Parisian company founded in 1925. They are white kid leather embellished with black. I can’t quite figure out the translation – it could little black seed pearls or steel beads. BabelFish was no help. 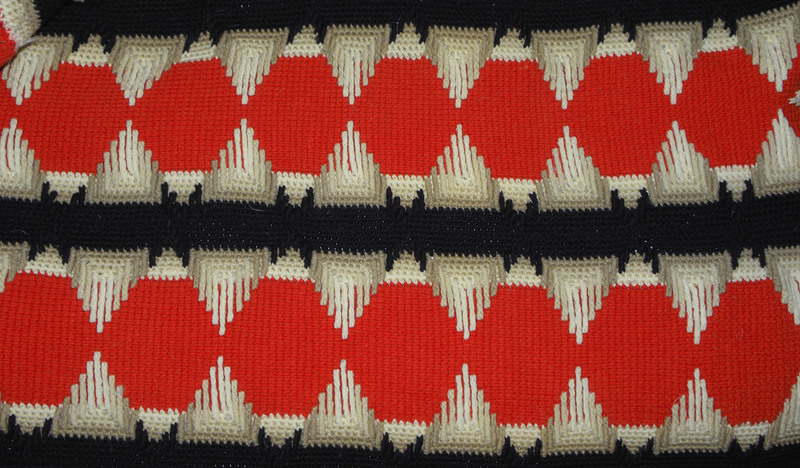 This photo shows is a section of a woolen afghan knitted by my mother’s great aunt in the twenties. The yarns are red, black, and a really interesting beige and cream mixed yarn. I really like the color combination and the geometric shapes.